The Jewels of Aptor is Shezad Dawood’s second solo show at Paradise Row. This exhibition describes flight paths and suggests arcs of movement through realms of esoteric wisdom. It continues Dawood’s ongoing practice of both revealing and creating moments of synthesis and unexpected harmony between seemingly disparate bodies of knowledge, cultural traditions and value systems. Accordingly the exhibition takes various texts as its starting point; The Conference of Birds byFarid Ud-Din- Attar, The Unlimited Dream Company by J G Ballard, and the eponymous The Jewels of Aptor, the 1962 novel by cult science fiction writer Samuel R Delany, set in a post-apocalyptical future in which a poet saves a princess trapped in a irradiated land full of mutants. 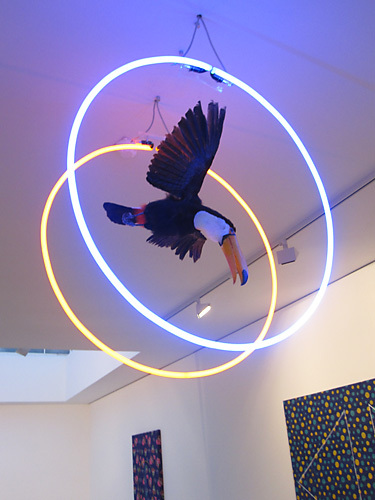 The show comprised of a careful variety of esoteric symbols printed and painted onto vintages textiles and a series of sculptures suspended in mid-air of strange and seductive exotic birds flying through rings of colored neon. Dawood’s stuffed birds are transfixed at the moment of their passage through their neon-bright, dimensional gateways to some invisible other world. And the paradox of their high-camp, retail-display aesthetics is that they almost trick you into believing that, maybe, some sort of mystical elsewhere might indeed exist, accessible by a wing-beat, or the painted curve of an ellipse. British artist Shezad Dawood’s Indian and Pakistani roots have long provided the perspective for his very particular remixing of Western and Eastern cultural artistic traditions. Dawood plays fast and loose with religion, modernism and popular mythologies. Refusing to be a type-cast by ethnicity, Dawood’s work is a sort of ironic cultural fusion, a self-aware art navigating the global-local stress-lines of the contemporary art world. Dawood’s exhibit will run through October 9 to November 13, 2010. 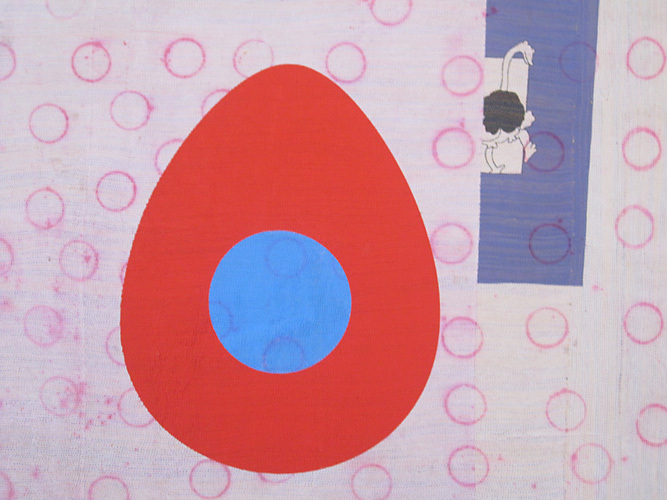 Paradise Row was founded in London by Nick Hackworth in October 2006 to support the work of a group of closely aligned young London-based artists.